Commons Farm Cottage in Wadsworth, near Hebden Bridge, Yorkshire sleeps 4 people. Commons Farm Cottage near Hebden Bridge is a beautiful, 17th-century, stone-built farmhouse cottage which can be found amongst the outstanding Pennine countryside high above Hebden Bridge. It is set in a simply breathtaking rural location, on a non-working farm, where the owners keep a small flock of sheep and a dog. The cottage adjoins the owners’ home, and has been completely renovated, yet has retained its character and charm with a stone entrance porch, exposed beams, original stone fireplace and large mullioned windows with spectacular views from each one. A luxurious hot tub sits on one side of the south-facing, flagstone patio; to the other side is the barbecue and outside dining area - the perfect place where you can relax and take in the peace and tranquillity whilst absorbing the surrounding panoramic landscape. Excellent walking and cycling are both available direct from the door, as the farm backs onto the Calderdale Way with the National Trust’s Hardcastle Crags and the Pennine Way close by. Although accessed by a farm track and in a rural location, just a 10-minute walk will take you to a local pub serving food (where the local bus stops), whilst the local hop/post office is just5 minutes further. The cottage is 1½ miles from Hebden Bridge with its abundance of shops, cafés and independent retailers, about 30 minutes on foot or less than 10 minutes by local bus. 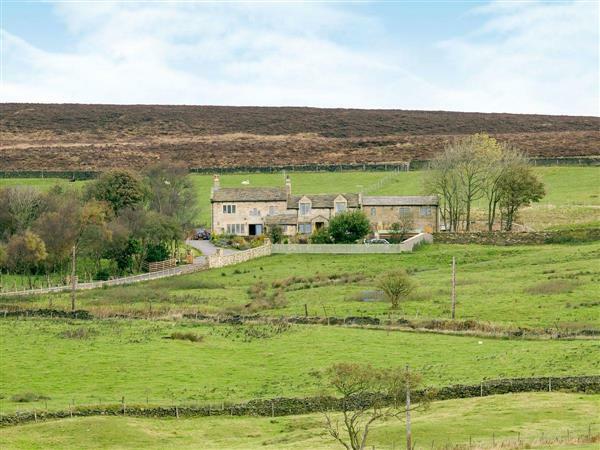 The local equestrian centre and Hebden Bridge Golf Course are both within 5 minutes by car. A scenic 20-minute drive will take you to Haworth with its wonderful cobbled high street and most famous as the home of the Brontë sisters. Around 50 minutes by car is the market town of Skipton, known as ‘Gateway to the Yorkshire Dales’, and the Peak District National Park can also be reached in around an hour. Hebden Bridge has excellent rail links to the cities of Leeds, Manchester and York, and for children, the highly acclaimed Eureka Museum can be reached in around ½ an hour. The shop/post office, pub and restaurant are all ½ mile from Commons Farm Cottage near Hebden Bridge. Living room: With gas coal-effect stove, oak beams and flagstone floor. Kitchen/dining room: With electric oven, electric hob, microwave, fridge/freezer, Freeview TV, DVD player and oak beams. Shower room: With walk-in shower, toilet and heated towel rail. Bedroom 1: With double bed, Freeview TV, DVD player and en-suite with walk-in shower, toilet and heated towel rail. Bedroom 2: With double bed, Freeview TV, DVD player and en-suite with walk-in shower, toilet and heated towel rail. Gas underfloor central heating, bed linen, towels and Wi-Fi included. Travel cot and highchair available on request. South-facing patio with garden furniture and electric barbecue. Hot tub for 5 (private). Bike store. Private parking for 4 cars. No smoking. Please note: This property has a natural water supply from a borehole. Holidays at Commons Farm Cottage run from Friday to Friday. For a better idea of where Commons Farm Cottage is, you can see Commons Farm Cottage on the map below. Commons Farm Cottage is in West Yorkshire; should you be on the lookout for a special offer, you can find all the special offers in West Yorkshire. It's always worth checking to see what is on offer at the moment. Do you want to holiday near Commons Farm Cottage (UKC2454), you can see other cottages within 25 miles of Commons Farm Cottage; have a look to find your perfect holiday location.